Pastor Gaby Rodriguez grew up on the Texas Oklahoma Latin District. Her parents have pastored the same church for over 30 years. Going to youth camps and district events were very formative to her spiritual development as a kid and a teen. At a youth camp she met the man who would later become her husband, Sergio Rodriguez. They have been married for 18 years, serve the Lord together in ministry and have been blessed with 3 children: Abigail (14), Esteban (12) and Abel (5). Gaby studied at Southern Nazarene University and Nazarene Theological Seminary and is passionate about serving the Lord and excited to share with us at youth camp this year. She and Sergio were youth pastors in their early ministry years and Gaby currently serves as the Executive Pastor at Trinity Church of the Nazarene in Oklahoma City. We are so blessed to have Pastor Gaby join us this summer to help us explore how we are FULLY known, found, forgiven, loved, and empowered. Join us as we pray that God would speak through her in powerful ways this summer! STXNYI Teen Camp is an annual event focused of fun, growth and worship. Teens from Waco to Laredo, Odessa to Orange gather together to fellowship, play and praise God for a week in Trinity, Texas. Share this with your Youth Groups to get them excited! Want to promote this event in your churches? Click the blue download button above for all the fun media resources! Looking for an easy way to fundraise for camp? Print off the image (10''x6'') found below on cardstock and laminate the front side. On it you will find 50 dots with dollar ammounts all totalling up to $200. Once printed and laminated, place these dime-sized (.70 in) stickers (link below) over each dot. 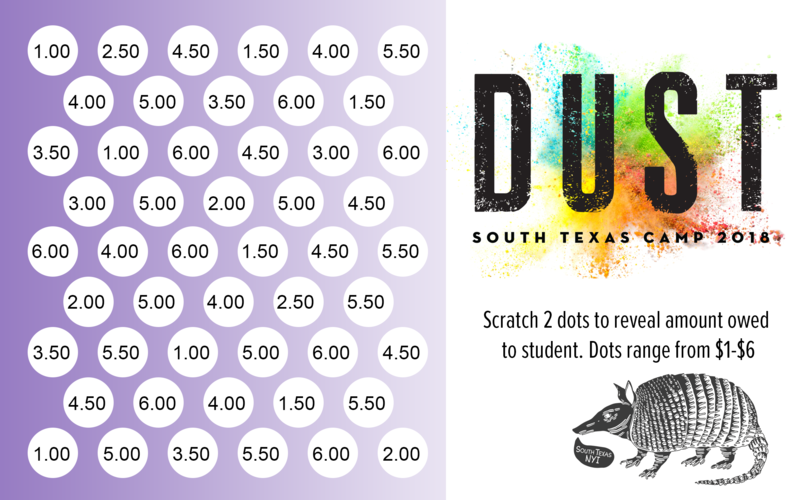 Have students take the card and ask people if they would care to scratch off 1,2, or all of the dots and donate the amounts revealed.